We’re in an age where interweaving personality and style is almost expected: dainty jewelry for the minimalists, fire engine red boots for the fashion forward, pastel blue lipstick for the daring, and chic studded boots for the punk professionals. Our wardrobe is so closely tied with our personality, it would be crazy not to bring this style to your wedding day. While you may not be willing to rock geometric eyeliner on your big day, there are a ton of other ways to incorporate your personality into your appearance. Check out these 4 bridal trends we’re crazy about! As someone who is sentimental to a fault, this is by far my favorite idea. While typical embroidered patterns of flowers are likely to pop up everywhere in the coming seasons, brides can take it one step further and embroider their wedding date, the couple’s initials, vows, or lyrics to the song they are planning on playing for their first dance. After your wedding, you can even frame your veil as a constant reminder of your beautiful day. If you’re someone who keeps up with what’s trending in fashion, you’ve likely noticed the copious amounts of velvet shoes hitting the streets (I’m currently wearing a pair of burgundy velvet booties I adore). Fortunately for you, velvet is an easy trend to incorporate in your ensemble. Throw on a pair of velvet heels in a neutral color, or better yet, choose a color that matches your decor. It’s a perfect way to bring street-wear to the table without going over the top. In case you haven’t heard, everyone’s been talking about the “year of the woman”. Enter: the pantsuit. Every bride deserves to feel beautiful, elegant, and sophisticated on their wedding day, but nobody talks about how powerful brides can be. If slipping into a pantsuit makes you feel as if you can run the world, why not wear it on your wedding day? 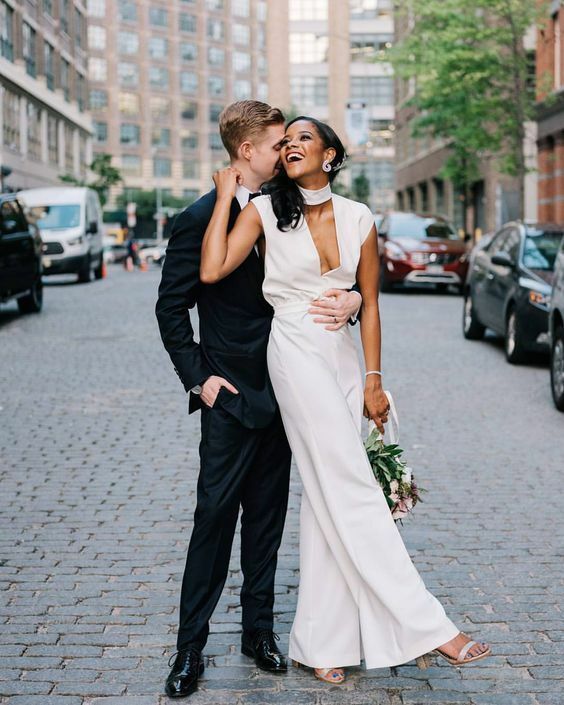 So many bridal stores carry white pantsuits as a staple now, but if you’re looking to take it one step further and wear a brighter color, look in the evening wear section of any department store. Does anyone remember the days we would wear giant costume-like rings as statement jewelry? Fortunately that trend has gone out of style, but statement pieces seem to be here to stay. Pieces can range from something as simple as layered necklaces (hey, you do that in your day to day life, why shouldn’t you bring it to your wedding day) or geometric earrings, to more eye catching items like ornate headpieces and sheer capes. Or you could be as fabulous as our bride above and pair textured earrings with a layered necklace and woven hair piece;) Whatever makes you, you, should be showcased on your big day! Welcome to Beyond The Buzz!